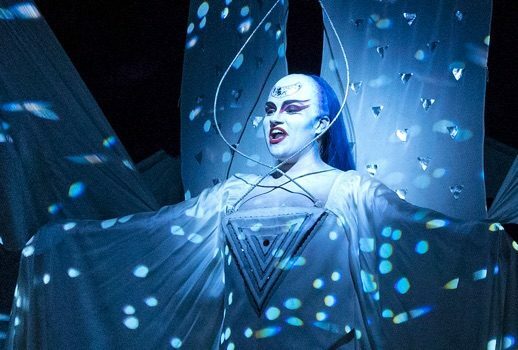 Julie Taymor’s production of Die Zauberflöte at the Met does what one wants for the opera: it gives its composer and performers a chance to shine. Despite her zany costumes, infamous dancing bears, and a set that manages to be both pleasant looking and utilitarian, Taymor’s stage direction remains simple enough to allow the music—and by extension, the voice—to take center stage. On Wednesday night, at the season premiere of the opera, the lingering presence of Maestro James Levine made itself known from the pit, where the august conductor led the Metropolitan Opera Orchestra in a tepid, though adequate reading of the score. Among the many performances, Kathryn Lewek’s Queen of the Night made good on her character’s name: she was the clear audience favorite. And for good reason. Her two show-stopping arias—“O zittre nicht…” and “Der Hölle Rache…“—highlighted her stratospheric range and nimble vocal dexterity. Despite a slightly brittle sound in the middle voice, her performance showcased a fearless artist with a unique instrument. Likewise, in her debut at the house, Golda Schultz was equally affecting as Pamina. In the famous aria, “Ach, ich fühl’s,” her gathered, creamy soprano spun long phrases of vibrant, acoustically resonant sound. As Tamino, Charles Castronovo possessed the heroic qualities required of the character. His tenor was darkly hued, with an almost baritonal timbre that suited Tamino’s more serious demeanor. His regal bearing contrasted nicely with the pleasantly oafish buffoonery of Markus Werba, whose good-natured Papageno provoked a few laughs while remaining authentically rooted in character and action. Continuing this exercise of well-managed singing and smartly tempered acting, Wendy Bryn Hammer, Sarah Mesko and Tamara Mumford were a smart set of three ladies. They moved briskly about the stage, well matched vocally; they were especially effective in bringing Taymor’s more interesting stage tricks to life. Their use of puppetry to present the three ladies as disembodied, floating heads remained a vivid gesture of stage magic, though at times they did resemble oversized singing sperm. Unfortunately, the entire cast did not fair as well as these leading performers. Christian Van Horn, as the Speaker, wavered in pitch and vocal quality; Taymor’s striking sets and costumes swallowed and consumed him. Similarly, Tobias Kehrer’s Sarastro seemed annoyingly pedantic, failing to project paternal warmth and majesty with his singing. As a work of music-theater, a whole host of concerns swirl around the character of Sarastro. If one buys his paternalistic rhetoric, then one is much more likely to forgive Die Zauberflöte’s problematic and old fashioned values. Indeed, the uncomfortable proposition attending the opera is that in order to enjoy Mozart’s genius score, one must also contend with Emanuel Schikaneder’s moronic libretto. This is a text that indulges all sorts of sexual, racial, and class stupidities, while remaining overtly corny and sentimental on notions of the Enlightenment and brotherhood. While watching Die Zauberflöte, one can easily see how such cultural values, lousy with ridiculous prejudice, could be taken to the extreme—resulting in, among other things, racial, ethnic, and sexual genocide. While much has been said of Die Zauberflöte’s similarities to Shakespeare’s The Tempest, the opera also participates in the same tradition as the playwright’s A Midsummer Nights’ Dream. The protagonists of both narratives leave the safety of light (the rule of a masculine sun god: domain of reason, order, and truth), in order to explore and utilize the wild possibilities inherent to darkness. Tamino’s quest is one that passes from feminine, lunar shadow—where reason has been voided, and pure emotion reigns—into the masculine brotherhood of light. In Schikaneder’s patriarchal cosmology, this darkness is the province of emotional women—not just the erratic fury of the Queen of the Night, but the pathetic supplications of Pamina as well. For example, in his quest to achieve enlightenment, love, and friendship, Tamino is instructed by Sarastro’s brotherhood to remain implacably silent; he is exhorted to shut his ears to anyone who bids him to speak, including Pamina, who desperately craves an affectionate word. Mozart utilizes this plot point to swell Pamina’s pathos. The audience easily succumbs. And yet, by the metrics of Schikaneder, yielding to such protestations is weak, cowardly, and (worst of all) unmanly. As the audience capitulates to Pamina’s sorrow, indulging her desire to be heard, we are convicted by the scenario. In short—we fail Sarastro’s test. Consequently, a more liberal sensibility will find itself more aligned with Papageno, the bird catcher, and his working class sensibilities, instead of Tamino’s princely pretention. Like Debussy’s Pelléas et Mélisande, Die Zauberflöte offers a director the chance to think radically about fashion and fantasy. And Taymor’s ingenuity is remarkable at times, though in retrospect many of the costumes, by Taymor as well (with makeup designs by Reiko Kruk), tend to make the cast look like Teletubbies in cheap knock-offs of Comme des Garçons. Where Taymor’s production is successful is where it elides the more uncomfortable and distasteful aspects of Schikaneder’s simple-minded libretto. While the socio-political, misogynistic, racist, and classist implications of the narrative cannot be eradicated or ignored, Taymor’s artistic vision and deft mise en scène move the proceedings along swiftly, enabling Mozart’s perfect music to gracefully leap forward and over the ugly philosophical pitfalls. All this is to say: what I got from this season’s Die Zauberflöte is what I’ve come to expect and hope for—impressive singing of a sublime score. Nothing more, nothing less. I’m in no hurry to throw the baby out with the bathwater. However, despite Taymor’s well-intentioned stabs at innovation, bathwater remains, as ever, bathwater.